Through recommendations of many friends and doing my own research, I decided to make an appointment with Dello Russo Laser Vision. Dello Russo has a reputation for being the pioneer of the Excimer laser and the down-up technique. They have been featured on NBC, FOX , ABC and various other TV channels and newspapers, they also have numbers of celebrity clientele. Dello Russo has four offices, one of which is conveniently located in Manhattan, however the day that was most convenient for me, I went to their Jersey office which is a 38,000 square foot, "eye emporium." It was a very big state of the art office. 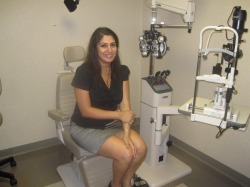 Once I entered the “eye emporium” I met a very friendly and helpful, LASIK Specialist (Clara) at the front desk. After filling out some brief registration forms, she started my free LASIK consultation. I was escorted into this darkened room where she performed measurements on the auto refractor, which took a digital measurement of my eye and automatically read my eye refractions. I then underwent an air-pull tonometer which read my eye pressure, and then went on to what they called a Nidyk which helps to eliminate people who are not potential candidates for LASIK. Lastly, my eye was measured with an Orbsan which uses ultra sound to study the shape and the thickness of the cornea and it produced a colorful map of both of my corneas. The LASIK Specialist then escorted me from the pre-screening room to sit in a waiting area where the walls had numerous pictures of celebrities who had used Dello Russo Laser Vision for their laser vision correction. After waiting a few minutes, I was greeted by my LASIK counselor and was escorted to an exam room where more tests were performed. The tests included pupil measurements, and keratometry which measured the depth of my cornea. The counselor discussed the procedure with me and the fact that I appeared to be a good candidate in a very comprehensive manner. The next step was to meet Dr. Joseph Dello Russo who examined my eyes and said that I looked like I would be a good candidate; however I would have to be re-examined at the time of my surgery because I had just removed my contact lenses and all the tests had to be repeated. He discovered that I had an eye infection and something he called Blepharitis due to my contact lens use and he gave me a prescription and sample of antibiotics to use prior to having the surgery, he also advised me to use something called lid wipes which are over the counter. I also was examined by Dr. Jeffrey Dello Russo who will be performing my surgery since he is the surgeon in New York on the day that I plan to have the LASIK eye surgery. Both doctors concurred with my diagnosis. I had the opportunity to talk to both doctors about the procedure and I felt comfortable with both of them. I have not worn contacts for seven days, have used the antibiotics for five of those days and my eyes feel better already. I made the appointment to have the surgery in their NYC office this week. I was told the appointment took and hour and a half of which the actual procedure involves is three minutes per eye, however all the measurements need to be re-done, and they have to ensure that I no longer have an eye infection and complete appropriate paperwork. I was told that after my surgery I will need to take a cab or use public transportation to go home, and I will be able to eat normally. I am very excited about my upcoming LASIK surgery! I have talked to a lot of people who have had LASIK, many of them with Dello Russo Laser Vision, and many of them have told me that it was the best money they ever spent and the surgery changed their lives! I look forward to not having to wear contacts ever again and being about to wake up in the morning without having to search for my eye-glasses! Since this is my first time experience getting LASIK, I thought I would share this experience with others that are contemplating getting LASIK. 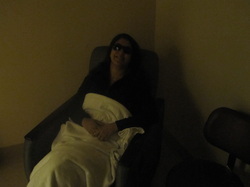 I will highlight the entire LASIK experience from start to finish. The days leading up to the surgery were very long and felt like it dragged on for months! In over ten years this was the longest I have ever had to wear my glasses. I realized how much of a challenge it is for those who have to wear glasses 24/7; I could not wear sunglasses, it is extremely difficult to put make-up on and it is very challenging to walk around in the rain when you have glasses on! I was very tempted to wear my contacts especially at night to attend events, however I realized that soon enough I would never have to wear contacts or glasses again and that definitely outweighed the discomfort of having to wear glasses for a few days. The day of the surgery was a bit nerve-wracking- I knew what to expect since I discussed the procedure during my initial consultation with Dr. Dello Russo, however I was still a little worried about the procedure and the idea of having someone stick a laser beam into my eye. As soon as I got to the Dello Russo office in Manhattan, I was greeted by the receptionist and was escorted to a room. After a few minutes I was greeted by a specialist who checked my eyes for any remnants of the eye infection and to check if my vision had changed since I had not worn glasses in a week. After the specialist left, Dr. Jeffrey Dello Russo came in to re-check for the infection and to discuss any questions I had about the procedure. I ended up asking more questions about the procedure, the risks, the rewards and about my nerves. Dr. Dello Russo was very patient and informative, he cleared away any hesitations I had and offered to give me something to calm my nerves for the surgery. He also discussed the risk that I may have dry eye after the surgery since I did have it when I wore contacts, and that I may want to have punctal plugs put into my tear ducts to alleviate the dry eye. I decided to have it done. It literally took two minutes to put into my tear ducts and it was covered by my health insurance. The next step prior to the surgery was to talk to a LASIK nurse about the post-operative procedures. 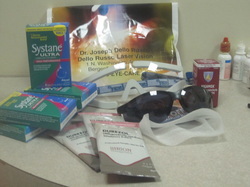 I was given a bag full of products that I needed to use after the surgery, this included goggles, sunglasses, several different eye-drops and instructions on how to care for my eyes after I leave the office. The nurse went over the instructions with me and brought up some important information on the two weeks following my LASIK Surgery which included no swimming, limited gym, sunglass use whenever I am outdoors, and the necessity of wearing goggles to bed and in the shower. After the directions and a number of numbing drops put into my eyes, I was brought into a cold room where the LASIK machine was located.. I was led to a bed in the room that would be where I would be positioned for the surgery. More numbing drops were placed in my eyes in preparation for the LASIK surgery. An instrument was used to keep my eye lids open so that I would not blink during the procedure. I spoke to the nurse during the surgery about the procedure and every step that she was taking. She was very friendly and very informative. She also mentioned some of her experiences and how many surgeries she had assisted in. When my eyes were fully numb Dr. Dello Russo began to create a flap in my cornea using the Intralase Laser, which then caused everything to go black. Once some of the corneal tissue was removed and the flap was replaced I was moved to the Excimer Laser and was told to focus on a red light. 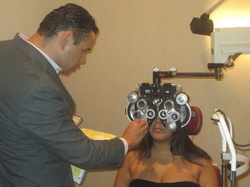 Dr. Dello Russo then performed the rest of the LASIK surgery. Each eye took less then two minutes. I felt no pain during the surgery, and I did not have to worry about accidentally closing my eyes. There was some slight discomfort since my eyes were kept open, but other then that the numbing drops did the trick! 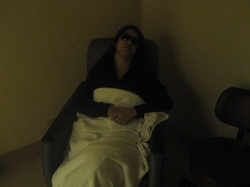 After the surgery, I was led into a dark room where I was given my sunglasses and was told to keep my eyes closed for twenty minutes. Prior to that, I had opened my eyes for a minute and I was able to see, however not completely clearly. I was told that the doctor had to insert contact bandages that will need to be removed the next day, until they are removed I would not see completely clearly. After twenty minutes I opened my eyes and noticed that I could see- not completely clear, however I was able to see better then before without glasses. I spoke to the LASIK Specialist who reminded me about the drops and the goggles and asked me to come in the next day for a follow-up. My friend escorted me home, when having the surgery you need to have someone take care of you, because the first night it is a little hard to see and so you need someone to help find a taxi or drive you home. After I arrived home, I did feel a slight discomfort, but no excruciating pain. I did however have to start putting in the antibiotic eye drops- which to be honest were the only pain that I felt during the whole process. I then went to bed for the rest of the night in my new goggles. After the successful removal of my contact bandages by Dr. Dello Russo, I noticed a HUGE improvement- I could see without glasses! It was unreal, it felt like I still had my contacts on and every night I had the urge to take my contacts off prior to going to bed- fortunately I remembered that I wasn't wearing any. The first two weeks were full of drops galore, sunglasses and goggles. There were three different types of drops that were to be used, one was for four times a day, one for two times a day and lastly one for every twenty minutes. The drops did cause a little stinging during the first couple of days, however it gradually stopped. It is extremely important to follow all directions given by the doctor, because during the healing process you do not want to mess anything up. A week after the surgery, I had to visit Dr. Dello Russo to see how everything was going. My vision was checked and then Dr. Dello Russo asked me if I had any issues following the surgery and how my vision has been. He also took a look to see how the healing process was going. He stated that everything looked great and that I would be able to discontinue to of the drops after the two weeks were up I could stop wearing the goggles to bed and to the shower and I can resume my normal activities, however I would need to use rewetting drops in case of dry eye. I was very happy with the results and will have to see him again in a month for another follow-up.